Hundreds of years of history at Peterborough’s most iconic building is being uncovered by teams of volunteers and school children. Dozens of people are helping dig in a number of pits at Peterborough Cathedral to learn more about the medieval history of the site. The dig, which started last week, will finish on Sunday during the Peterborough History Festival. Site director Matthew Collins said: “There have never been any archaeological excavations of this part of the Cathedral grounds before. “We know there was a medieval fish pond here, which would have been used as a food source. When the dig is finished the finds will be analysed at the University of Cambridge, before being handed back to the Cathedral. Children from All Saints School were among the volunteers at the dig this week. Emily Ryley, from Access Cambridge Archeology, said: “Children have been getting their hands dirty and looking in test pits. “They have been learning leadership, teamwork and co-operative skills, as well as digging, report writing and map work. The Peterborough Heritage Festival will take place on Saturday and Sunday this week. The highlight will be a Viking invasion re-enactment, which is taking place twice on Saturday and twice on Sunday in Cathedral Square. 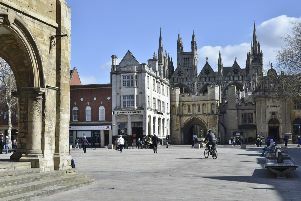 Other events taking place in the city centre and the Cathedral grounds include lectures, stalls and even a mobile cinema. For more information about the festival turn to pages 50 in this week’s Wow 24/7 events guide.